December | 2016 | Home: Free Sociology! What if we treated every day like a holiday? Imagine prioritizing time with family, over and over again; repeatedly enjoying travel at its most crowded; eating so much rich food that we practically burst; and buying so many expensive gifts that we drive ourselves into debt, every single day! I suspect it would be awful, and I actually like my family! It would also be bad for democracy, bad for our health, and bad for the planet, not to mention absolutely unaffordable. Yet all across North America, this is pretty much the ideal behind how we’ve fashioned our cities, at least since the first half of the twentieth century. Insofar as it matters, we’re zoned for the holidays. Zoning is the primary legal force behind the sprawl of single-family detached houses we see choking off the older, denser workaday urban cores of every major metropolis on the continent. Most people live in single-family residential zoned neighborhoods, which we might also think of as Great House Reserves. Nothing but houses, houses, and more houses is allowed across the majority of our metropolitan landscapes. All those detached single-family houses prioritize privacy and focusing time on our families, or at least one particular version of our families, to the exclusion of sharing more public spaces with those around us. The more we live in houses, the less we tend to encounter people different from ourselves, diminishing our sense of obligation to others. What’s more, to get anywhere interesting, or even just to get to work, people who live in houses tend to first have to get past many other houses that look much like their own. So they drive on roads clogged with other drivers. And travel to work isn’t optional, because living in a house is really, really expensive. In many cases, zoning for houses has been used to keep out the poor on purpose. Yet we all pay for houses, even people who don’t live in them. That’s because houses take up a lot of land and eat up a lot of energy, leading to all sorts of broadly shared environmental costs. And living in a house isn’t even very good for us! People tend to be healthier when they integrate walking or cycling into their daily lives, and to do that, it helps to have places to go. Could we build our cities differently? Are we ready to stop treating every day like a holiday? One answer might be found in Vancouver, Canada’s third largest metropolis. 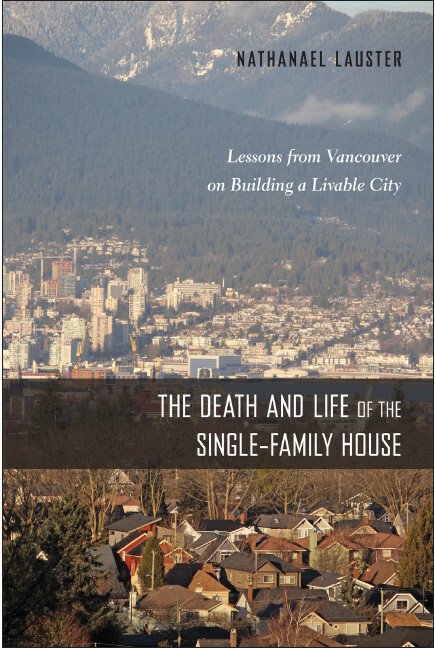 Over the last fifty years, Vancouver has moved farther and faster away from reliance upon the single-family house than any other metro area in North America. Indeed, as residents will quickly confirm, no one except millionaires can afford a house in Vancouver any longer. How has this dramatic transformation affected the people who live here? Well, let’s start with how the city is regularly ranked the most livable on the continent. If you’re skeptical of the rankings, try talking to some of the residents. As one middle class apartment dweller recently explained to me: “I can walk to the end of my street and there are probably, at a minimum, thirty ethnic restaurants within three minutes of my front door. I overlook the ocean. Access to transportation, to work, it’s so central. It doesn’t matter where I go, I’m in the middle of everything! And yet, I feel like I’m in a tiny little community. I know all the shopkeepers. I know all my neighbors. It’s like being in a small town, but living in the center of a huge city. I really feel like I have the best of all worlds.” Vancouver is proof that alternatives to the house can be made imminently livable for all types of families as well as for those living alone. Despite the travel, the cost, and the occasional family fractiousness, the holidays can be nice. But treating every day like a holiday is a recipe for disaster. In much the same way, living in a house can also be pleasant. But it’s only one way to live the good life. Vancouver demonstrates there are many more versions of the good life worth considering. By prioritizing only one kind of dwelling in how we zone, most metropolitan areas are severely constraining our options. What’s more, they’re driving us toward the least socially just, least sustainable, least healthy, and least affordable lifestyle possible. Maybe it’s time to reconsider and open up our options. Maybe we should start building our cities for everyday life instead of zoning for the holidays.